Just a blog that rants about nature, culture, detours and things that seems pointless in life...or maybe not. 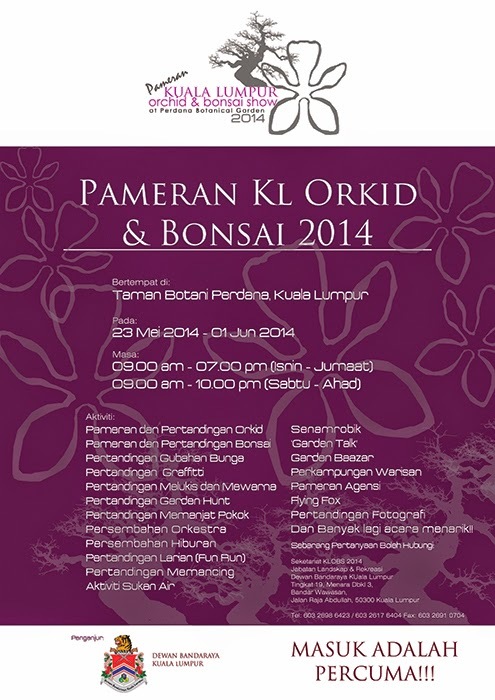 For those who love bonsai and orchids, the Kuala Lumpur Orchid and Bonsai Show 2014 at KL Lake Gardens (Taman Tasik Perdana) is on from 23 May 2014 - 1 June 2014. The opening ceremony is scheduled for tonight (23 May). Besides the flowers and bonsai on display, there are many activities that are not plant/flower related including fishing competition, photography competition, musical performances and even flying fox! So do go and visit the KL Orchid and Bonsai Show 2014 and entrance is free. Overlap with FRIM traditional herb expo at PWTC :). Can go on one of the days :-) But better on the first few days. The next weekend most of the display would be weather beaten. Don't forget Floria in June as well! More towards things I can consume. Me a glutton. Bob is at your place? Yes he is in KL. Well, technically, I am at his place. One of the fig is fruiting. Good! Bob is saying the first fruit belongs to the father, lol! My mum had four. If rain, the fig can split due to too much water and turn sour. Syoknya 4 biji dapat. Your fig is growing much better than the white genoa. Oh baru perasan which mean I can go next week.